I started writing The Pantry Raid at 17, when most of my peers were dining hall-dependent. The recipes I shared were a novelty to them and impressive to my older readers. I say this not to sound arrogant, but to juxtapose that with my current experience. By way of living in San Francisco and working at a food company, I now find myself surrounded by people whose culinary dexterity often supersedes my own. I may be the girl with the food blog, but I’m far from knowing it all. I have a lot to learn – about technique, intuition, vocabulary, ingredients – and am fortunate enough to have plenty of teachers. So with that, here’s a new favorite recipe courtesy of my fellow diva and olive enthusiast, Gerard! When we made this tapenade the first time, it was paired with crispy homemade potato chips and whipped Cowgirl Creamery ricotta cheese. Let’s take a moment to appreciate that last sentence. Okay, great. The second time around, I made a batch for an Ocean Beach bonfire. We served it alongside my Greek Yogurt Caramelized Onion Dip (this time caramelized with white wine) and a lot of kettle chips. Cowgirl Creamery’s Mt. Tam cheese made a surprise appearance (thanks, Dan!) and the two went great together slathered on top of torn fresh bread. 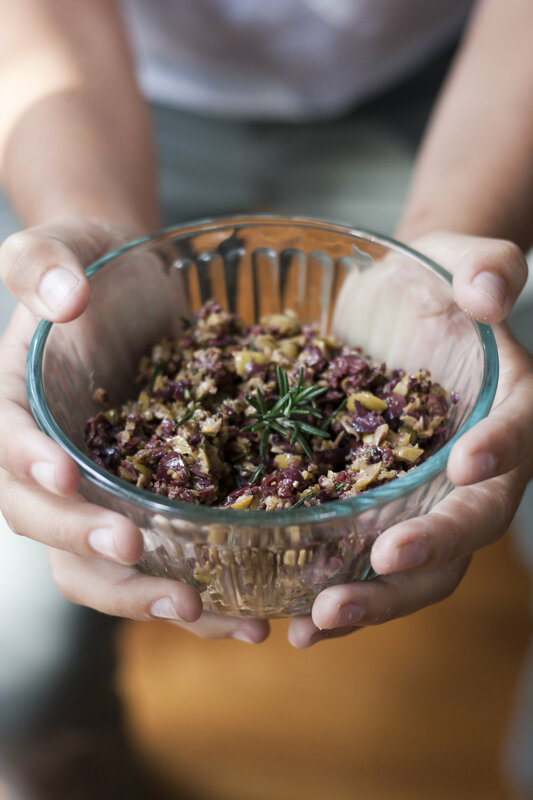 The lesson here is that this Rosemary Olive Tapenade is versatile in both flavor and application. Use it for dipping, spreading, dolloping, smearing, and whatever other eating verbs that you know and I don’t! If your olives aren’t pitted, pit them! No need to keep things pretty – just do what you have to to get those pits out. Rinse and de-stem your rosemary. Combine all ingredients in a food processor. Pulse in short intervals until all ingredients are nice and chopped. Check often to avoid ending up with olive paste! 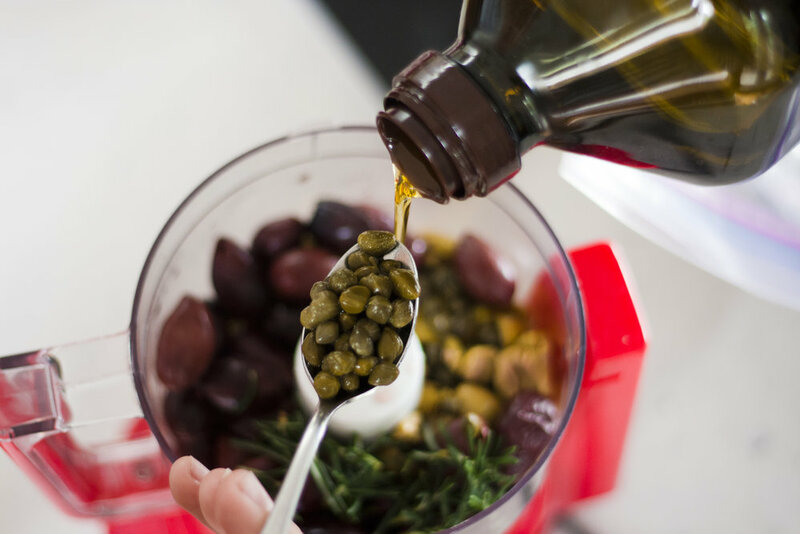 Add a little more olive oil if the mixture seems dry. Add salt and pepper to taste. You’re done!